A trap is defined as an opening through the stage floor. A number of different types of trap have evolved over the years, depending on the needs of various productions. A lowered rectangular section used in Hamlet etc. It’s usually around 6′ long and 2’6″ (or 3′) wide, and is usually positioned downstage centre. A simple opening through which items can be passed into a cauldron with no bottom on stage. A set of triangular sprung flaps in the stage floor through which an actor can be propelled from a lift below stage. The Vampire Trap was invented for James Planché’s 1820 adaption of Polidori’s The Vampyr. It involved two spring leaves that parted under pressure and immediately reclosed. Placed in the floor or stage wall, it could give the impression a figure was passing through solid matter. The Corsican Trap, made for Dion Boucicault’s 1852 adaption of Alexandre Dumas’ The Corsican Brothers, involved an ascending track, on which a wheeled cart could be run, rising up out of the stage through a ‘bristle’ trap – a trapdoor covered with bristles painted to match the scenery. Once on the stage and in view, the track was covered by a sliding arrangement reminiscent of that of a roll-top desk; towhit, nothing was seen except the ghost rising up through the floor and gliding across the stage. This trap is also sometimes called a Ghost Glide. The Gaiety Theatre on the Isle of Man is one of few theatres around the world with a functional Corsican Trap, which was restored in 2000. The Theatre Royal, Drury Lane has a system of hydraulic stage lifts still in place. Lifts are increasingly employed in scenic automation systems for lifting large set pieces (or groups of people) into position centre stage very quickly. Lifts can also be used to help animate a piece of scenery or vehicle. A special kind of trap is used to cover a lift opening in the stage floor, known as a DROP AND SLIDE TRAP. The mechanism is complex, but in operation it looks smooth. A section of stage floor is dropped down a few inches, and that section of floor then slides to one side, making an opening through which the scenery (or performers) can pass. The lift base then forms the stage floor until it is lowered again, at which point the trap slides and lifts into position to fill the hole. A variant of ‘slot’, this was a system of vertical rails or runners used to lift a profile of scenery or a groundrow through a narrow cut in the stage floor into the audiences’ view. Large open space under the stage of many theatres. The trap room allows access to the stage floor from below. This is where actors or crew await their entrance through traps, and where equipment on stage lifts is set up. It is often also used as a substitute for a crossover. Modern productions with scenic automation make tremendous demands on the traditional trap rooms. The production of The Lord of the Rings: The Musical at the Theatre Royal, Drury Lane, required the whole of the understage area to be cleared, including vintage stage machinery. The whole setup was carefully documented by historians before being removed, and after the show closed, the equipment was reinstated, and proven to be working, before the next show moved in. The London production of Billy Elliot at the Victoria Palace theatre needed a deeper understage space than was available, so approximately 4m of excavation took the theatre’s equipment to within only 2m of the Victoria underground line. Permission also had to be granted by Buckingham Palace as the theatre is situated close to the Royal Sewers. Trap doors were built into the stage allowing dramatic entrances during the performances of plays. The height of the stage was five feet – so the area beneath the stage was easily big enough to hold actors. This area underneath the stage was given the title “Hell”. This was taken from the term ‘hell mouth’ which was used to refer to any trap-door in the bottom of a stage (called the cellerage). 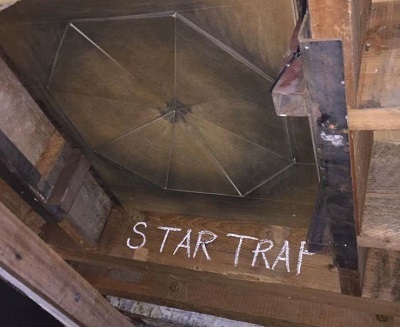 The Globe theatre stage was believed to have had two trap doors on the outer stage and one trap door on the inner stage called the “grave trap”. Actors would hide in “Hell” waiting to make their entrance or to create other special effects. Unusual special effects could be made from ‘Hell’ including different sounds using different musical instruments such as the trumpet, or drums. Actors skilled in imitating the baying of hounds and crowing of roosters or the wailing of ghostly sounds would also be waiting in ‘Hell’.